Play in nature and have a good time with animals. Fun place for families. 15min by car. Situated in the town of Kasumi, the Frog Rock or Kaeru-iwa is a rock that resembles a frog. Local people make wishes to the rock. 45min by car. Here you can have good soba noodles. The shop name is "Teppen". If you make an arrangement, you can try preparing the soba dough. 15min by car. Closed on Wednesdays. Built in 1912, Amarube Bridge is 310 meters long and 41 meters high. The bridge become famous after a train fell off the bridge in 1986. 30min by car. Located near the bank of Haruki River, Arayu is the spot where 98 degree Celsius hot water springs out of the ground. 5min walk. Enjoy making a boiled egg in the natural hot spring water. It is fun to make the onsen boiled egg. (It takes 13-15min to make one.) Raw eggs available at our front desk for 53yen each. Ashiyu is a public foot bath that spans 7 meters. Put your feet in the warm water of hot spring. 5min walk. The statue of Yumechiyo is standing in this park. It was modeled after Sayuri Yoshinaga, an actress who played the role of Yumechiyo in the TV drama "Yumechiyo's Diary". 6min walk. Yumechiyo Nikki is the story of a woman who is suffering from leukemia, the result of exposure to the atomic blast when she was still unborn. In the last three years of her life, she returns home, a small hot spring resort in the San-in Region and runs a geisha house inherited from her mother. The show was filmed in October, 1981 and aired from January 17, 1982 to February 14, 1982. 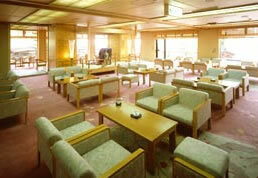 On your arrival, we offer you powdered green tea in the lounge. Drink the tea and make yourself comfortable until your room is ready. We offer it even if you are alone or if you are a group of 60 people. 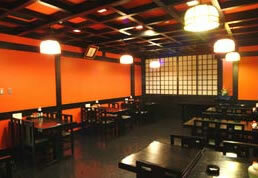 The restaurant offers the finest selection of sake from the Tajima region. Room service is available. Open from 8:00 pm to midnight. Stone therapy is a type of thermotherapy. Hot stones and oils are used.